Prussian Blue is used here in some of the shadow areas on the napkin, around the apple and in the shadow on the table under the napkin. 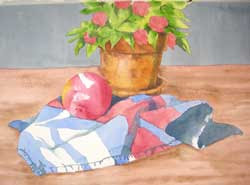 Other colors that work well are Pthalo Blue and Indigo. Be careful with these colors, however, because they are very intense, dark and staining. Staining colors don't lift well, if you decide later that the application was too dark. So use lots of water and apply these colors frugally.